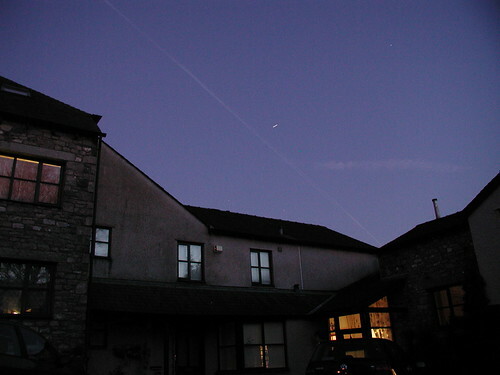 The International Space Station is back in a position that lets it orbit over the skies of Kendal in the evennings. As darkness falls, there is a brief period where the solar panel arrays can reflect sunlight towards the surface, allowing the ISS to appear as a bright star arcing from the West or South-West over to the East or South-East. 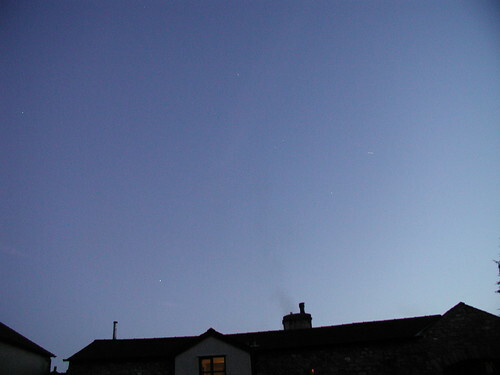 If the ISS appears too early or too late in this period, then it will appear to fade away mid way through the arc (or appear mid way through it). 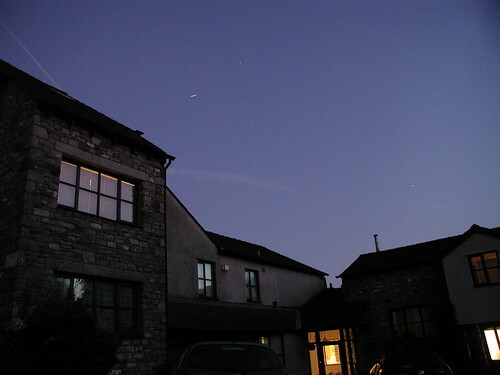 Times for ISS passes can be found on the website Heavens Above (times for Kendal here). The same website will also give information on bright comets, other satellites and a bit of general astronomy. One other satellite feature they can provide are Iridium flares. 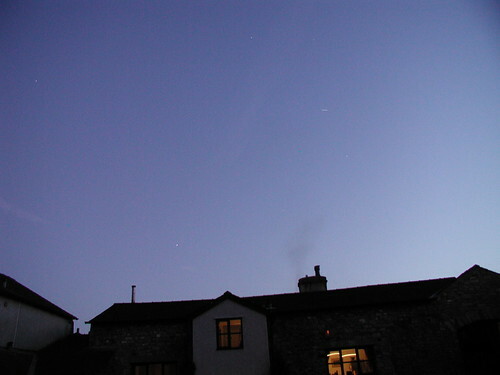 These are similar to ISS passes, but much shorter, far more localised and much brighter. Sunlight reflects off a spinning Iridium satellite and gets beamed, torch-like, to a point on the Earth’s surface. If you’re close to the centre, you get a bright star appear in the sky for a few seconds before fading away. If you’re a few dozen kilometres away from the central point, you see nothing. Heavens above gives its brightnesses in terms of Magnitude. This system divides the stars in the sky up and says the brightest ones are around magnitude zero and the dimmest ones visible to the naked eye in the best possible skies are brighter than magnitude six. The brightest Iridium flares can be magnitude -8 or greater (so bright they can occasionally be seen in daylight). The times for these for Kendal are mentioned here. I state this not just to pad out a short blog post, but also because there’ll be a fairly unusual happening in the skies of the town on Monday. At 19:01:55 or thereabouts (say seven o’clock and wait for five minutes or so), there’ll be a magnitude -8 flare. 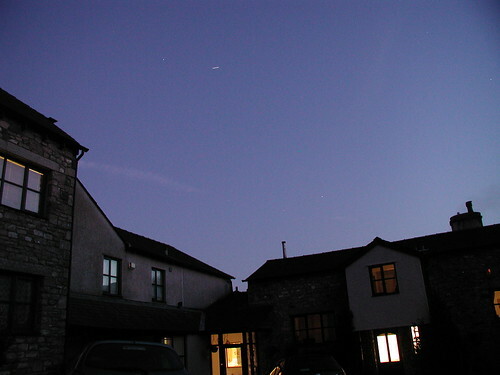 Eight minutes later, the International Space Station will pass over the town, high and bright. Later on, at 20:37:30 or thereabouts, there will be a second -8 flare. Again, eight minutes or so later, there’ll be another pass of the ISS (this time, very low and it vanishes after a moment or two as it passes into the Earth’s shadow). This will all depend on whether or not it is clear, if not, the satellites will still do their stuff, but no-one will see it. I’ve been observing the ISS for its passes during the week, starting with a magnitude -1.7 pass at around 7pm on the 7th of March. The sky was wonderfully clear, as it has been all through the week, and as the station dipped down into the south-east, something popped up in the south-west – a Chinese Lantern. I cannot be sure exactly where it came from, but these things are known to be released in Ulverstone as well as near Windermere and still get to Kendal. In this case, it was travelling south and I first saw it heading away from me rising in the direction of either Underwood or the green opposite the Rifleman’s arms. It would’ve then headed on to Oxenholme. 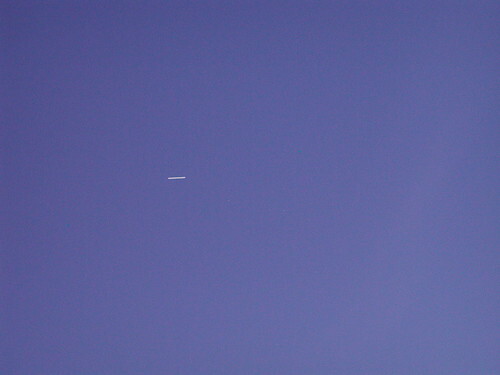 Sadly, as the ISS pass was relatively dim, I wasn’t taking pictures, so nothing exciting to put here beyond that. The passes on the following days were all pleasant enough, but the one earlier on this evenning was a little different as instead of the ISS moving across a black background, this time the sky was still nice and blue. This pass provides the images in the post, and if you go to my flickr page, find those images and blow some of them up, you might even see Orion starting to peek through the twilight. This entry was posted in Astronomy, Eyeball astronomy, News, Satellites. Bookmark the permalink.